SAMPARI, the name of the morning star in the Biak Island language, is an art exhibition and series of events that celebrate West Papuan cultures and explores the nation’s environment, ecology, politics and history. The main aim of the exhibition is to raise awareness of the West Papuan peoples wish for independence and right to self-determination. Jaïr Pattipeilohy’s arresting photograph Cultural transmission (above) is one of thirty-six works exhibited by artists from The Netherlands, America, and Australia, as well as the Melanesian nations of West Papua, Maluku, Solomon Islands, Vanuatu, Fiji, and Papua New Guinea. As well as photography, the works include oil on Belgian linen, oil and acrylic on canvas, archival marker on paper, ink, lino cut print, one computer vector illustration on wood, etch, collage, terra cotta base releif, raw natural objects, macrame, digital art and photography. DR JOHN BALLARD, Associate Vice-Chancellor (Melbourne) of the Australia Catholic University opened the FEDERAL REPUBLIC OF WEST PAPUA’S second art exhibition in the ACU Art Gallery on 2 December 2016. The popular chief explained how the spectacular artworks assembled in his university’s spacious urban gallery will boost the psychological and physical health of a people who have endured a debilitating racist occupation for more than half-a-century. Sampari 2016 includes an exhibition of twenty-eight historical cartoons published after the arrival of 43 West Papuan asylum seekers in 2006. The asylum seekers had beached their double-outrigger canoe at Mapoon on the west coast of Cape York Peninsula on 17 January 2006 with a banner stretched across their prahru SAVE WEST PAPUA PEOPLE FROM GENOCIDE. Immigration Minister Amanda Vanstone believed their claims and issued them protection visas, sparking outrage in Indonesia and a bluster of appeasing strategies and contradictory policies in Australia. President Yudhoyono withdrew his ambassador. Prime Minister Howard tried to excise Australia from ‘designated unauthorised arrivals’ (refugees). It took the prickly neighbours ten months to find a truce, and only then within a formal agreement (The Lombok Treaty) that outlawed the West Papuans’ Morning Star flag in both countries! 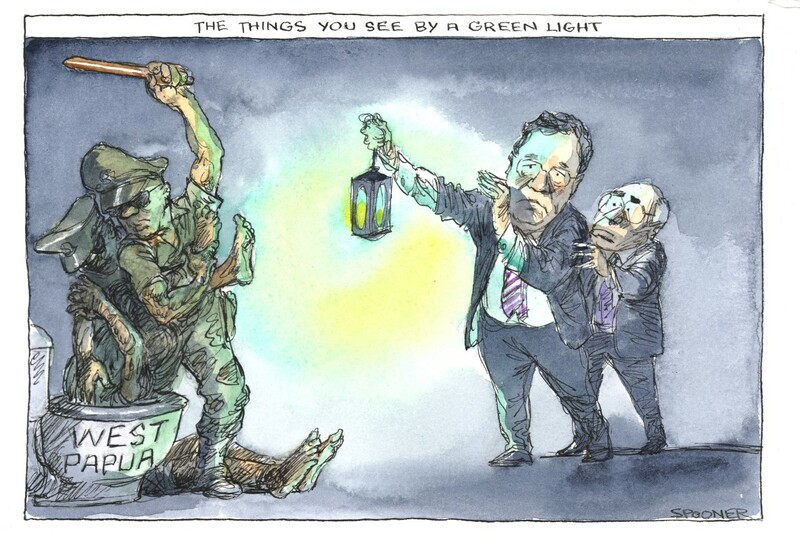 The realpolitik behind the Lombok Treaty was artfully captured by cartoonist John Spooner (The things you see by a green light The Age, 9 November 2006). By the time it was signed, ten months after the asylum seekers had landed, twenty-eight other cartoons had been published in the mainstream media, all megaphoning the deep chasm between the Australian peoples’ concerns and opinions and how their politicians were legislating their concerns and opinions. The most controversial cartoon was BILL LEAK’s, of President Yudhoyono in the guise of a dog mounting a West Papuan; a rejoinder to Indonesia’s FONDA LAPOD’s drawing of Prime Minister Howard and Foreign Minister Downer as copulating dingoes. 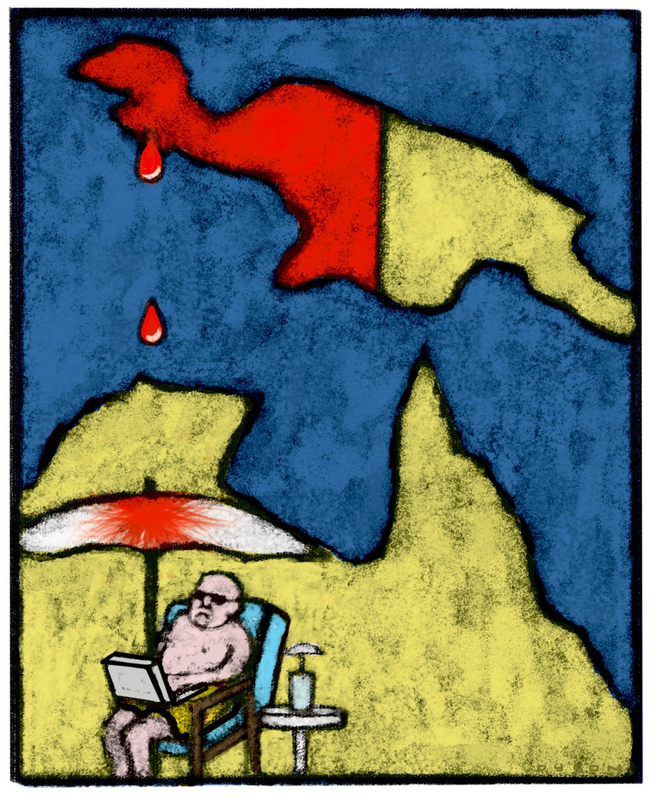 However, all the cartoonists—Zanetti, Campbell, Pope, Sharpe, Nicholson, Scott, Spooner, Davidson, Kudelka, Dyson, Knight, Ditchburn, Pryor—skillfully captured the capacity of occupied West Papua to expose the enduringly dysfunctional state of relations between Australia and Indonesia. A SERIES OF EVENTS IN THE GALLERY DURING THE EXHIBITION FOR POETS, SONGSTERS, MUSICIANS, WRITERS, ACTIVISTS AND INTELLECTUALS TO DISCUSS AND DEBATE ISSUES ASSOCIATED WITH WEST PAPUA’S INDEPENDENCE AND SELF-DETERMINATION. 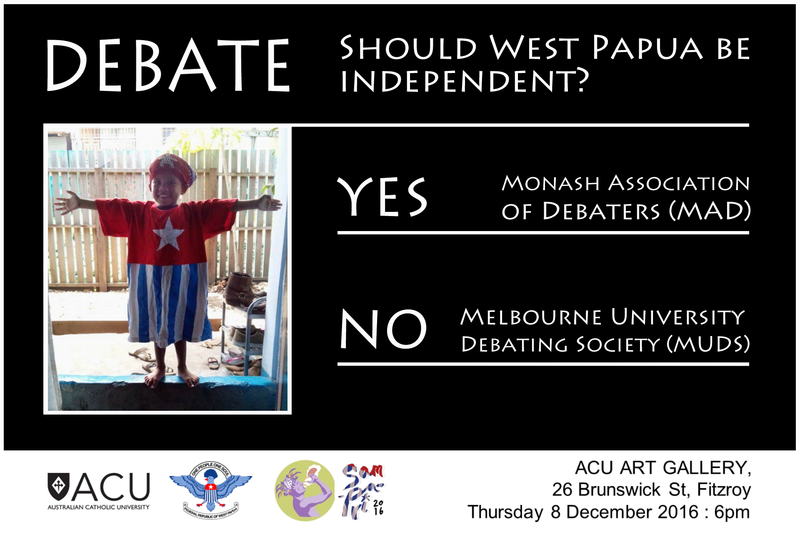 Debate: Should West Papua be Independent? MELBOURNE IS A CITY OF POETS AND POETRY and we even have a ‘Melbourne Poets Union‘. A host of these precious scribes is assembling in the ACU Art Gallery on 3 December to twist their prodigious talent around West Papua liberation. Kylie Supski will be there. Last year she penned a poetic response to Jacob Rumbiak’s Letter to West Papua’s Heroes and Heroines, then baptised ‘the twins’ at the Dan O’Connell Hotel on 9 January 2016. So will Tim Hoffmann from the West Papua Rent Collective. And Laura Brinson, ReVerse Butcher, Andy Jackson, Chalise van Wungaart, Mary Chydiriotis. Also Brendan Bosnack who must have written “for whom did you chisel that line in the sea, one side for the drowning, one side for the free” with our Indonesian-occupied territory in mind. SALUTING MELANESIA celebrates the courageous decision in 2015 by Solomon Islanders, ni-Vanuatu, and the Kanak of New Caledonia to champion West Papua’s entry into the Melanesian Spearhead Group and Pacific Islands Forum. The islanders have continued carrying their kin’s political burden in 2016 within a PACIFIC COALITION FOR WEST PAPUA that is tasked to reinsert West Papua on the United Nations Decolonization List. The UN Secretariat removed West Papua from the list in 1969 after the Act of free choice and despite fundamental structural flaws in this so-called ‘referendum’. It was Dr Tom Wainggai’s revolutionary vision of his homeland as ‘the western border of Melanesia, stolen by Indonesia in 1962′ that revitalised West Papuans historic sense of self and orientated the peoples struggle towards its kin and cultural heartland in Melanesia-Pacific. 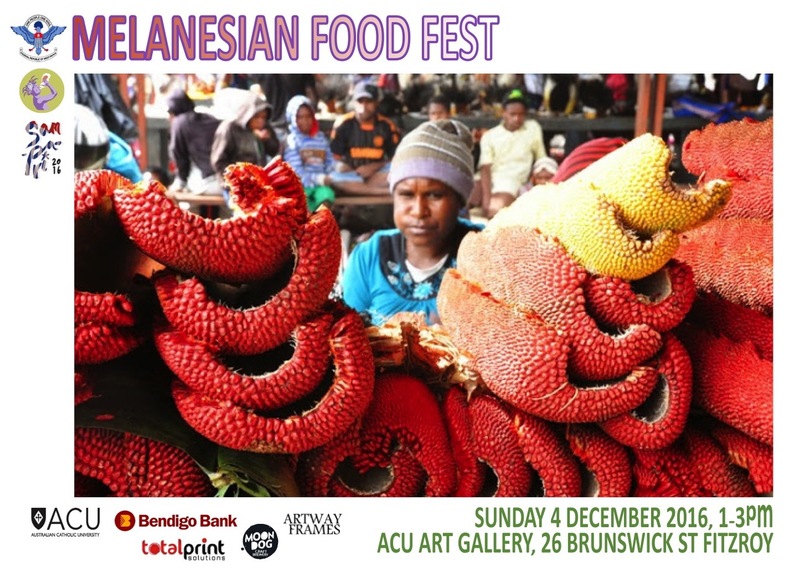 DAPUR SAMPARI (West Papua kitchen) is cooking and sharing food with Melanesian kin in the ACU Art Gallery on 4 December. The Melanesian seed-to-plate custom has its own historical story, beginning 7000—9000 years ago when Papuans domesticated the wild ancestors of sugarcane, hibiscus spinach, highland pitpit, pandanus, taro, banana, and numerous other species. At this time, at the end of the last Ice Age, they also perfected a drainage method that enabled them to control water and regulate soil moisture. With the arrival of the Austronesian speakers 3,500 years ago, pig husbandry techniques were developed. This debate, surrounded by the SAMPARI ART EXHIBITION FOR WEST PAPUA, is a space for leading representatives of the millennial generation to express their views about the long-standing sovereignty dispute over West Papua. Footscray trio LUNAR FLARES opens the event with a sonic exposition of the key themes of the debate. as far too primitive to act as the mature, rights-bearing subjects of popular sovereignty that liberal thinkers place at the heart of the modern nation form” (Why Papua wants freedom: the third person in contemporary nationalism Public Culture Vol. 20, No. 2, 2008). LAND OF THE MORNING STAR, written and directed by Mark Worth, is the most important and comprehensive historical documents about West Papua. This screening is a memorial tribute to Mark, who died mysteriously in a hotel room in Sentani (West Papua) forty-eight hours after the ABC announced the premiere screening of his masterwork. Guest speaker, Greg Barber MLC, Leader of the Victorian Greens, visited him in the hotel a few days before he died. Mark was born on Manus Island in Papua New Guinea when it was an Australian naval base, and as a young boy witnessed the arrival of refugees from West Papua after the UN’s fraudulent Act of Free Choice in 1969. 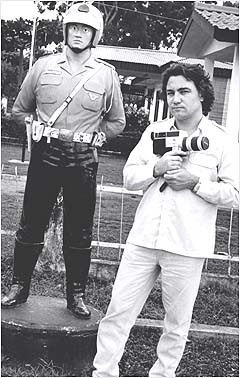 After studying at the Swinburne Film School in Melbourne, he pioneered the one-man style of guerilla filmmaking that by the time of his death in 2004 was commonly used by ABC and SBS current affairs programs. “Mark was more Papuan than even he realised and he landed, like a Martian, into the greyness of Melbourne, bursting with stories of other worlds. There was no art, no music, no political crisis that didn’t have a brilliant parallel in tribal Melanesia. Jacynta Fuamatu is the Melbourne representative for 350 Pacific, a climate change action group with strong regional partners that advocates for Pacific islanders. Wensi is concerned with forest destruction in West Papua and its global consequences. The forum also features a parade of designer Off2War’s wearable art made from recycled materials. 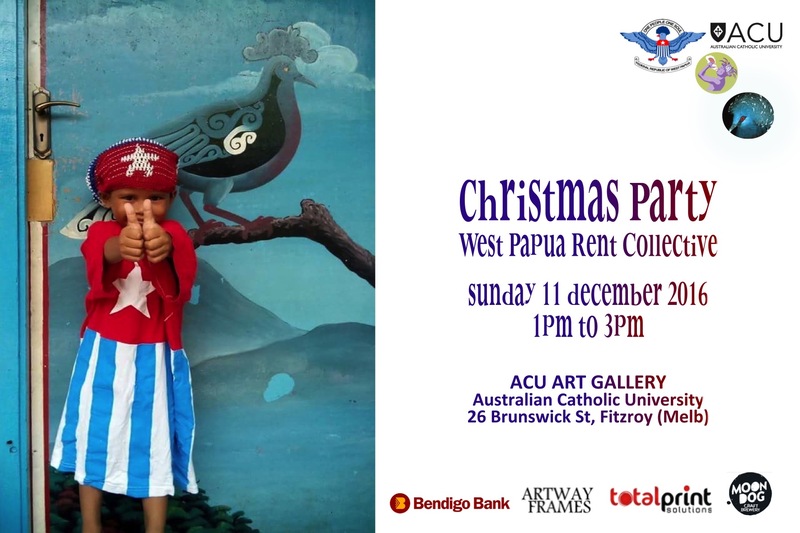 WEST PAPUA RENT COLLECTIVE is a unique galaxy of Australians investing in West Papua’s future as an independent Melanesian state. Their $30/month ($360/annum) deposits pay the rent on the FEDERAL REPUBLIC OF WEST PAPUA’s inspiring five-star-energy office on the Yarra River at 838 Collins St in Docklands (Victoria). The Federal Republic of West Papua (FRWP) was established in 2011 by five thousand academics, church leaders and senior tribal leaders. It has both self-determination and resistance capabilities and operates in measured opposition to Indonesia’s administration. The FRWP’S DEPARTMENT OF FOREIGN AFFAIRS, IMMIGRATION & TRADE opened in Docklands in June 2014 and is co-ordinated by Jacob Rumbiak, the only FRWP Executive living outside West Papua. The FRWP WOMEN’S OFFICE led by Babuan Mirino and Natalie Adadikam opened six months later. Both departments are developing activism and bureaucracies within the guidelines of Self-determination, Sustainability, and Good Governance. 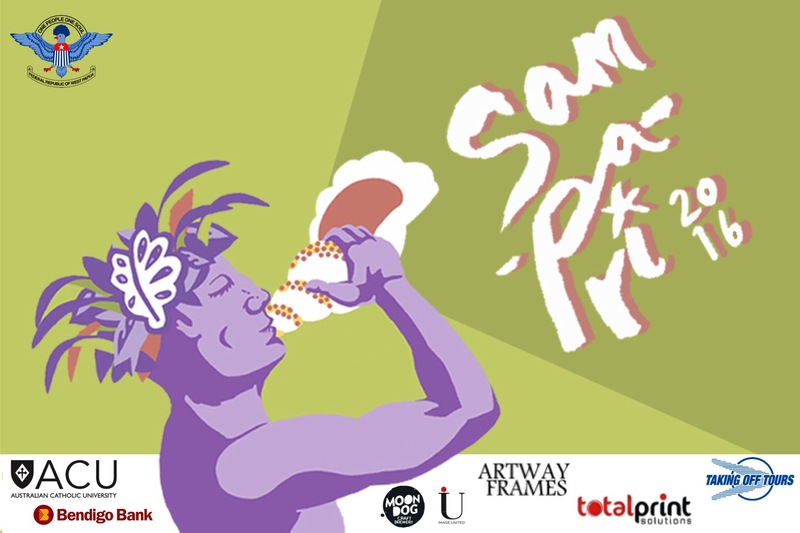 SAMPARI SPONSORS West Papua’s escalating profile in 2016, as distinct from ten years ago in 2006, has meant a healthy number of firms became interested in sponsoring the Sampari Exhibition. Besides the AUSTRALIAN CATHOLIC UNIVERSITY, this includes BENDIGO BANK, MOON DOG CRAFT BREWERY, ARTWAY FRAMES, TOTAL PRINT SOLUTIONS, TAKING OFF TOURS TRAVEL AGENCY, IMAGE UNITED PHOTOGRAPHY. The Federal Republic of West Papua sincerely thanks these captains of industry for their support.